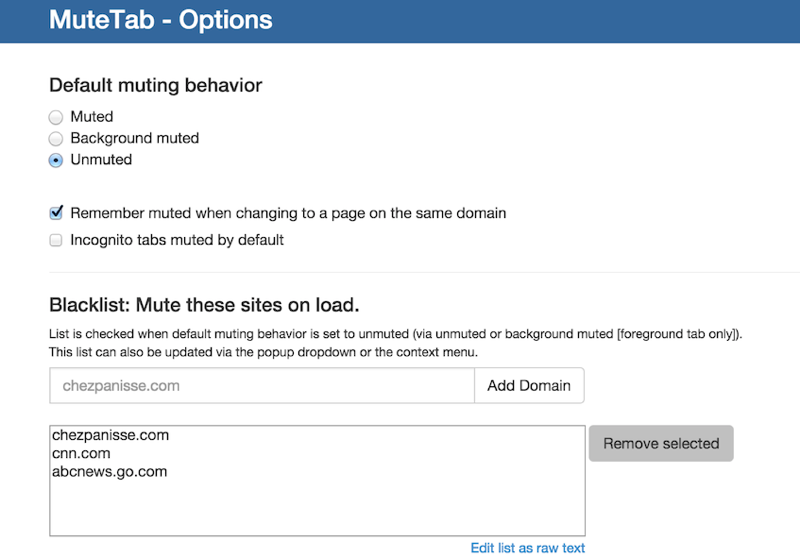 June 2016 update: The latest release (MuteTab 3.0) takes advantage of new extension access to Chrome's audio indicators and muting ability while adding new features such as mute by default and blacklists. MuteTab is a Chrome extension that gives you enhanced control over your browser's sound. The extension was first released in 2011 as an experiment in providing browsers with a better sound management experience given limitations imposed by Chrome and Flash. This latest version takes advantage of work done since then that gave Chrome audio indicators and tab muting and made that accessible to extensions to fix previous functionality and add new features. Shows only tabs that are playing sound now or did so recently. This is great if you have a large number of tabs open, they span across windows, or you want help identifying what was playing sound. 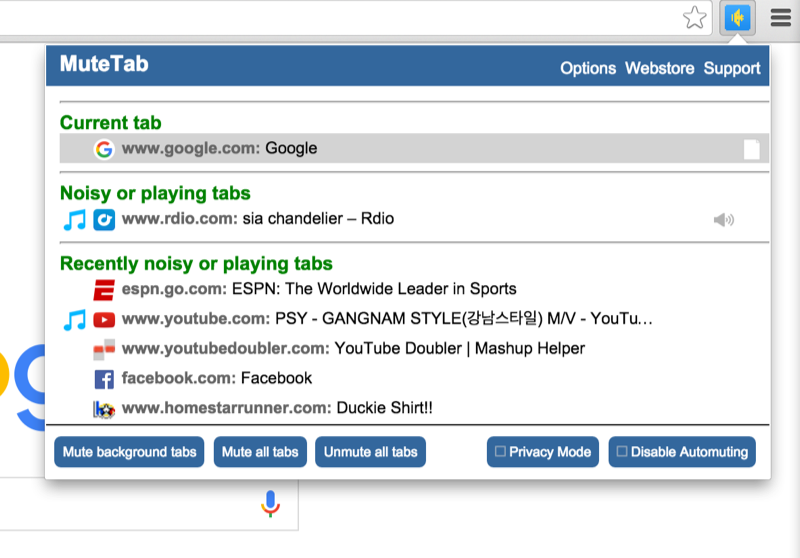 Mute all tabs, background tabs, or incognito tabs by default. Buttons and keyboard shortcuts to mute all tabs, mute background tabs, and unmute all tabs. Set exceptions to muting behavior via whitelists and blacklists. Add your music player to a "music list" so that it gets excluded when muting all or background tabs. "Privacy mode" will mute/pause all of your tabs (including your music) when you want silence; you can then unpause or unmute tabs you want to listen to. You can assign it to a keyboard shortcut, too. Disable automuting lets you temporarily disable all of the above behavior. See a count of noisy tabs you avoided hearing by hovering over the "MuteTab" text in the top left corner. Experimental music ducking feature mutes your music when you watch a video and plays it again when the video finishes. Created by Jared Sohn. Feel free to contact me with questions or issues (but try to read the text in the webstore first :)) on github, at mutetabextension at gmail.com, or @mutetab on Twitter. Also, if on Windows check out mute.fm; it pauses your music while you watch videos and restores it afterward.